Bali Kintamani volcano tour with Ubud village is a day trip package that is included in Bali full day tours activities category to see Bali volcano which is well-known as Mount Batur and its beautiful lake view, to see Ubud Tegalalang rice terrace which is very famous as one of the wonderful Bali terrace farming landscape and other best places of interest for 8 to 9 hours. Bali Kintamani volcano and Ubud sightseeing tour is a combination of Kintamani trip and Bali Ubud tour package to explore the wonderful countryside and landscape in the north-east part of the island of Bali, Indonesia. Bali Kintamani volcano and Ubud town trip is one of the most popular among other Bali day tours packages because in one day we can explore the different parts of Bali, visit the temple where the local Balinese people use to go to purify themselves, visit the art villages, see the Balinese daily life and other top tourist attractions that are really worth to know and will give you unforgettable experiences as the part of your holiday in this gorgeous island. Ubud and Kintamani volcano excursions will be accompanied by our professional and friendly Balinese tour driver that will give you the best quality services and provided with an air-conditioned vehicle for tours transportation that will make your trips really comfortable. If you're looking what is the best things to do in Bali in a whole day, then Ubud - Kintamani sightseeing tour package could be an option for you to fill up your holiday to go to the top places to visit in Bali. Below is the itinerary of Ubud Kintamani Bali tour package in a whole day with the selections of top Bali tourist destinations from Bali Places Tour. Please be informed that this trip is private, it means that only you (your family or your partners) and our driver. Check also our Bali half day tours program for other itineraries that is available in the short day. The primary region to be traveled to on Bali Ubud Kintamani excursion is the Batubulan village to watch the Barong & Keris dance show. Batubulan generally recognized for the central of stone carvings on Bali island. 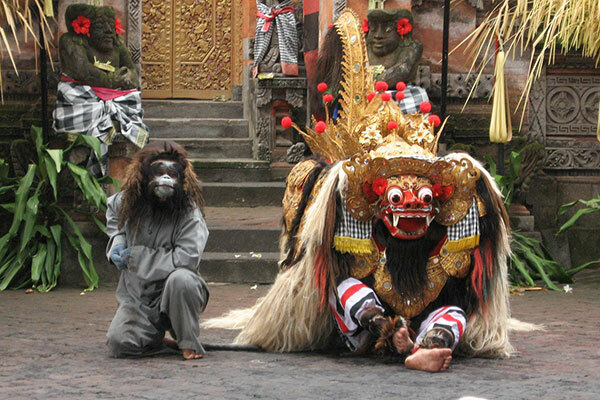 "Barong" in this dance performance is a lion-like creature and figure in the mythology of Bali, Indonesia. Barong is actually the king of the spirits, leader of the hosts of good, and the enemy of "Rangda", the demon queen and mother of most the spirit guarders in the mythological tradition of Bali. The combat between Barong and Rangda is shown in Barong dance performance to symbolize the never-ending struggle between bad and the good or right and wrong. Celuk is included in the variety of Kintamani and Ubud sightseeing tour schedule. Celuk is the popular village on the island as a touristic location due to its local people are actually active and also high in designing to the gold and silver jewelry production. Most of these silver and goldsmiths operate their work in up to date design in situations if they are ordered. Along the main roads, we can easily find out a lot of art shops. 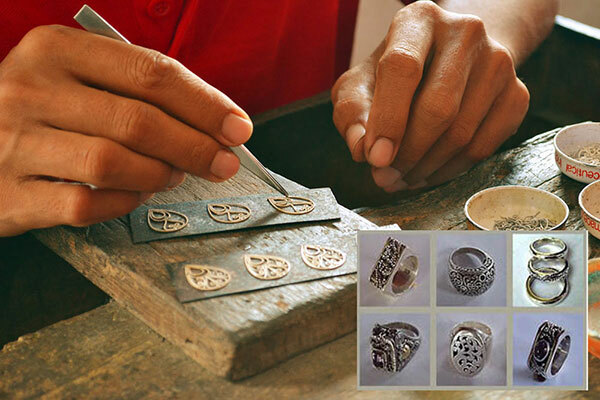 Each art shop presents a workshop where the people will be able to look at the artisans making the handmade silver jewelry. Batuan is included in our choices of Ubud and Kintamani route, its situation about 9 km or only more or less 20 minutes from Ubud central town. Batuan is a village on the island of Bali. It is famous for its artwork and model of hand painted drawing which began in the village in the 1930s and has since shown up in a main Balinese art style, generally known as a Batuan painting style. It is definitely a major painting central and has various art galleries and collaborating art societies which have presented a significant part in supporting the art painting of Batuan. The following destination to go in Ubud rice terraces and Kintamani volcano trip activities is to visit Mas wooden carvings center. Mas is a village in the area of Ubud, Gianyar regency, Bali. Mas is well known for the wood made handicrafts and furniture with excellent export quality and nicely processed and also tested. 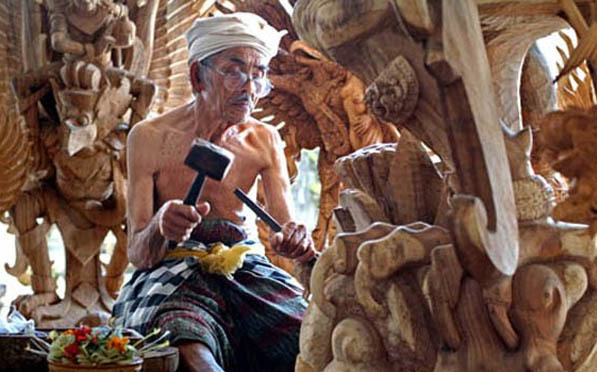 Mas is a central part of wood carvings on the island of Bali, the majority of the adult people in the village of Mas could carve the wood made statues and furniture with a variety of styles and awesome creativeness, a lot of family members in Mas producing wooden crafts for sell and export. Here we are going to see various galleries from small to the big one to display and offer wooden craft which has been recognized around the world. The next place to be visited on the Ubud - Kintamani trip is The Tirta Empul Water Temple Bali, Tirta Empul temple (Indonesian: Pura Tirtha Empul) is a Hindu Balinese water temple situated close to the area of Tampaksiring, Bali, Indonesia. The temple yard includes showering construction, popular for the holy spring water, in which Balinese Hindu people come to visit for ritual purifying. The temple pond consists of a spring which supplies out clean waters continually. 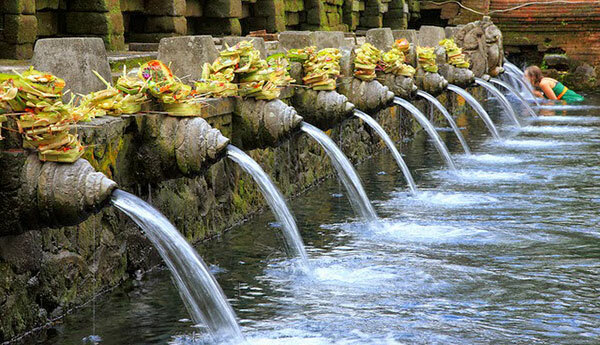 Tirta Empul signifies Holy Spring in Balinese. 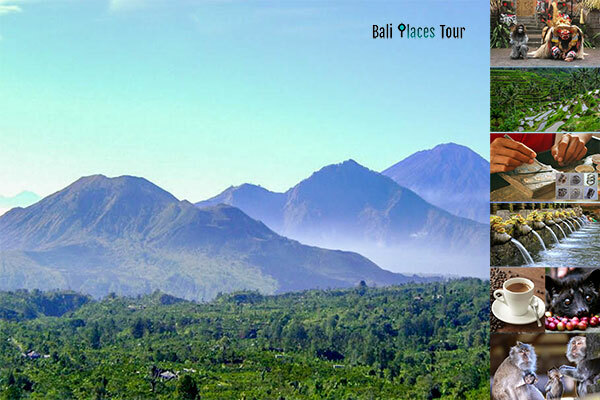 Check also (Kintamani Besakih Tour: Bali Volcano & Bali Mother Temple Trip). The following place to visit on Kintamani - Ubud trip is to visit coffee plantations on the way to Kintamani mountainous area. 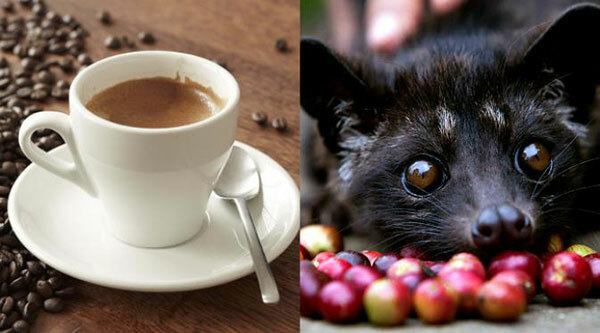 Have you heard about "Luwak Coffee"? It's one the best coffee in the world. Luwak Coffee or Civet Coffee (Indonesian: Kopi Luwak), means the coffee consisting of part-digested coffee cherries consumed and defecated by the Asian palm civet (Paradoxurus hermaphroditus). If you love coffee, then we will stop here to look how the process of manufacturing The Luwak Coffee traditionally but the hygiene remained in priority, and also the nice thing is we can try and taste it. We will stop at the restaurant for having lunch with astonishing sights and fresh cold atmosphere of the mountainous area of Kintamani Bali. Kintamani is a highland area of north-eastern Bali at the Mount Batur caldera, it is well recognized as only Kintamani. It is located on the rim of the large Batur caldera more or less 1,500 m above sea level, and provide spectacular scenes of the lake Batur and also the Mt. Batur (1,717 m) which is known for the most active volcano in Bali island, Indonesia. 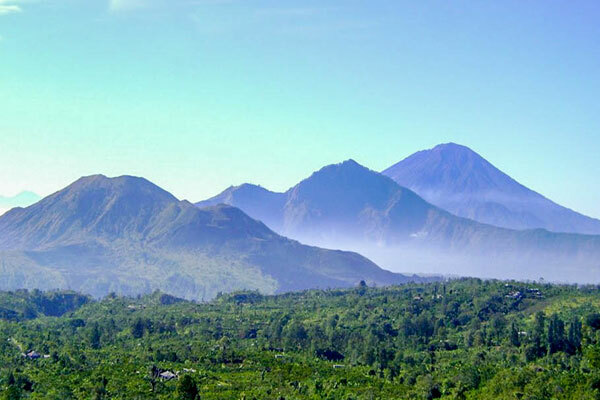 Check also (Kintamani Bali Volcano Tour: Full Day Itinerary to See Mt. Batur). 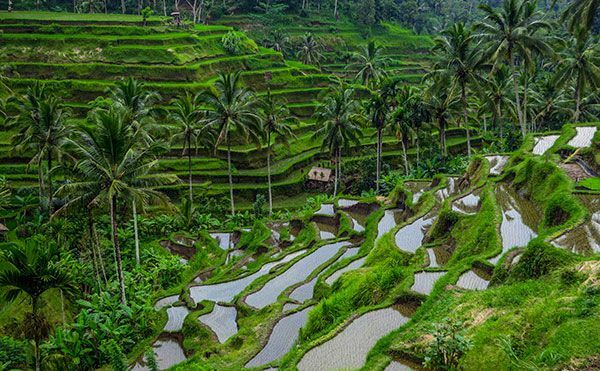 The next site to go on Ubud and Kintamani excursion is Tegalalang rice terraces which are situated close to the Ubud region. Tegallalang Rice Terrace is popular for its magnificent views of terraced rice paddies which are traditionally still using The Subak system (The ancient Balinese water management method or irrigation). Tegalalang Ubud rice terrace is one of the most visited and photographed terrace farming landscape in Bali, Indonesia. The final tourist destination to go on Bali Kintamani & Ubud one day tour packages is to visit The Ubud monkey forest, it is a nature preserved area and Hindu temple complex in Ubud, Bali. 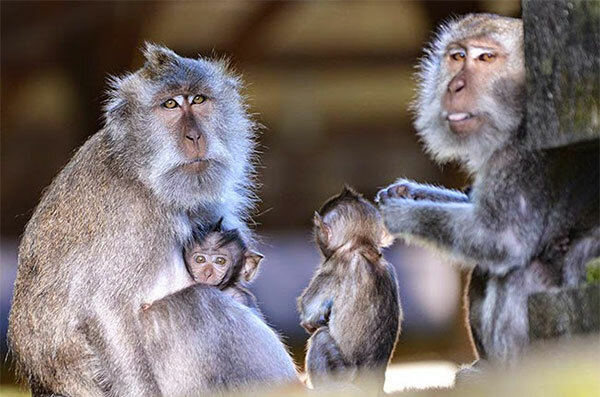 Its official name is the Sacred Monkey Forest Sanctuary (in Balinese is called Mandala Suci Wenara Wana), and the official name which is displayed on the welcome board is the Padangtegal Mandala Wisata Wanara Wana Sacred Monkey Forest Sanctuary. The Ubud sacred monkey forest is a popular place to visit that is usually visited by more than 10,000 people per month. The groups of monkeys that inhabiting Ubud monkey forest is regarded as the crab-eating macaque (the research name is Macaca Fascicularis), generally known as the long-tailed macaque is a cercopithecine primate native-born to South East Asia. Below are the most frequently asked questions about Bali Ubud - Kintamani sightseeing tour package, feel free to contact us for more information. What is included in Kintamani volcano and Ubud tour packages? It's included Air-conditioned vehicle, English speaking driver, parking fees, petrol, toll fees. What is NOT included in Ubud and Kintamani full day tours package? It's not included your meal (lunch), personal expenses (shopping, etc), entrance tickets to visit tourist sites and Balinese dances performances. What to bring in Kintamani and Ubud Trip? You can wear simple casual outfits, bring a bottle of mineral water to avoid dehydration (The island of Bali has high humidity), sunscreen to avoid skin burn (Bali is hot), Sunglasses, money (for lunch, entrance tickets, or shopping), medicines (if you're on treatment), camera/smartphone. How much the entrance ticket price to watch Barong dance show? The entrance fee to see Batubulan Barong and Keris dance performance is IDR 100,000 per person (updated 2018), you can pay directly in the location. How much the entrance fee to visit Tegalalang rice terrace? The entrance ticket to visit Tegalalang rice terraces is IDR 15,000 /person (updated 2018). How much the entrance fee to visit Kintamani area? The entrance ticket to visit Kintamani tourist area is IDR 30,000 /person (updated 2018). How much the entrance fee in Ubud sacred monkey forest sanctuary? The entrance ticket to visit Ubud Bali monkey forest is IDR 50,000 for adult, and IDR 40,000 for children (updated 2018), you can pay directly in the location. Can I touch the monkeys in Ubud Bali monkey forest? No (it's not recommended for your own safety), do not touch the monkey, even they are friendly but sometimes they can attack if they're disturbed, and please take care of your personal belongings (glasses, handbag, wallet, camera, phone, etc). Any restrictions, etiquette or dress code to enter Balinese Hindu temple? Yes, all the Bali temples are sacred, and to respect the holiness of the temple we have to follow some rules. The common etiquette to enter Bali temple, e.g. to wear Balinese sarong or scarf (can generally be rented in the location or sometimes it's included in entrance ticket price), cover your upper body (dress in simple clothes and wear a top that at least coverings your shoulders), you shouldn't enter into any temple in Bali during menstrual cycle (for the ladies). We are sorry for the inconveniences but these are some common rules to follow for visitors when doing temple touring in Bali. What kind of food is available for lunch in the restaurant at Kintamani? Most restaurants in Kintamani are serving buffet lunch with various menus (mostly Indonesian food). We will take you to the standard and nice one for your lunch while enjoying the stunning view of Batur Volcano and its lake in Kintamani Bali. I'm interested in going for Ubud and Kintamani trip, how I book? You can simply email us or you can fill up the form at our booking page to book the Kintamani and Ubud sightseeing tour or any other tours and activities by mentioning the ID that is posted in every tour packages on our site (ex: UKT-01 for Ubud Kintamani Bali Excursions) and you have to book at least one day before. How I pay for Bali Ubud and Kintamani day tour package and how much the cost? At the moment we accept the payment by cash and the price is IDR 550,000 (Indonesian Rupiah), you can pay directly to our driver that come along with you for Bali Ubud & Kintamani tour activities. We will convert the price if you would like to pay in a different currency. Please be informed that the price of Ubud & Kintamani trip above is per vehicle (not per person).